After putting together a quick summary of the first half of the New Zealand trip, doing the finishing touches in the early hours of the morning, it was off to Mt Alfred as the day looked promising despite the forecast of southwesterly winds. That blog was an excuse to get some of my gopro photos online and address some of the curiosity surrounding my new wing (as well as document my initial impressions). But now on New Year’s Day in Brisbane (having arrived yesterday) I theoretically have a little time to put together some more notes and photos while friends slumber. On my 22 December flight I slowly worked my way up Mt Alfred in a southerly crosswind from the NE launch just half an hours walk up the hill. Finally up things looked good and despite my freezing cold hands (why didn’t I take the overmits!) I entertained grand thoughts of flying towards Aspiring. In the photo above behind the main cloud you can see a line of cloud lining up over the west of the Earnslaw burn. A solid climb (probably 5m/s) off the front end got me up but with the cold and feeling things were easy I didn’t even top out. Never a good idea. Finding nothing on the Richardson range I slope landed (sinky descent ended up giving my right knee a dull ache when bent during driving etc in the following week or so). Sat around for a few hours before relaunching and scudding down to the valley. Yes, another long walk down the Rees. Getting to Muddy creek carpark around 6pm I suddenly realized that of course I wasn’t going to get a lift out! (No one around). So I ambled down Muddy Ck and up river a bit until I found a crossing point – balls deep. Finally my slug up the hill was rewarded by a flyable descent down the ridge past Lover’s leap and pushing through the sinky NW valley wind to land at my car after sunset. I’m glad I got out there and made use of the day though as in the next few days the norwester came in. Probably a good excuse to do something social for Christmas (not to mention whittling away my to do list). The party in Queenstown and embarrassingly generous hospitality in Wanaka by way of a Christmas breakfast justified the drive. I threw all my toys in the boot (not to mention the various toys lent to me by various friendly locals!) 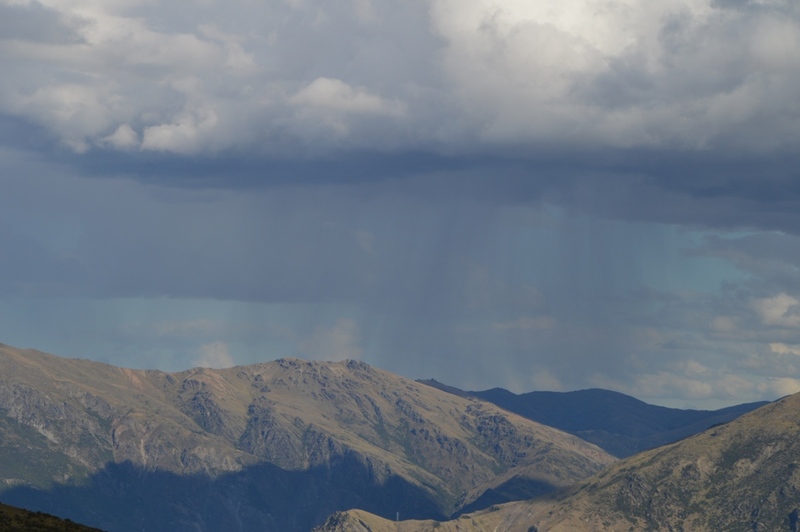 and remained in Wanaka for the last part of my trip. 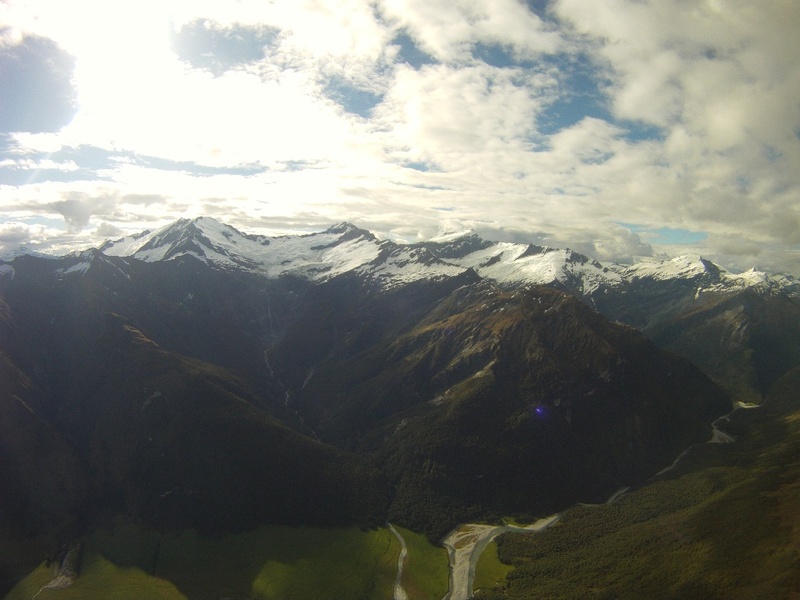 Boxing day was flyable at Treble cone but with a northeasterly pattern setting in it suffered from humidity (overcast cloud cover). The next day (27 Dec) after an extended wait on the hill , chatting to one of Rob’s tandem passengers to be (a dutch girl), things brightened up and I took off. 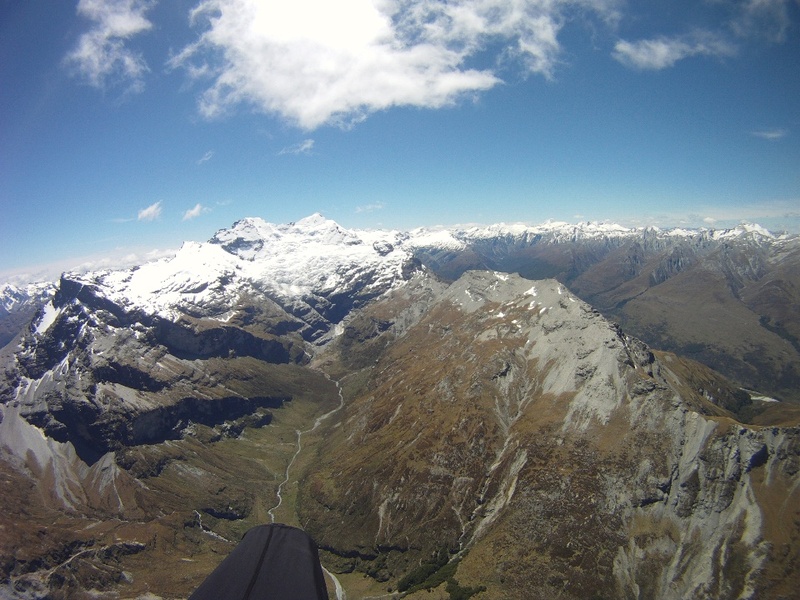 Chasing two other pilots I bumbled off down the valley, generally a few thousand feet below. Pretty cliffs to fly by and warmer was my excuse! I also actually liked having the opportunity to explore ratty air and leeside cliffs with the LM5. We rendezvous’d opposite the East / West Matukituki junction, soaring thermodynamic lift. I elected not to follow them into the West Matuk and enjoyed a scenic ride in the East branch, after giving up on top landing above Homestead peak cliffs to pee. 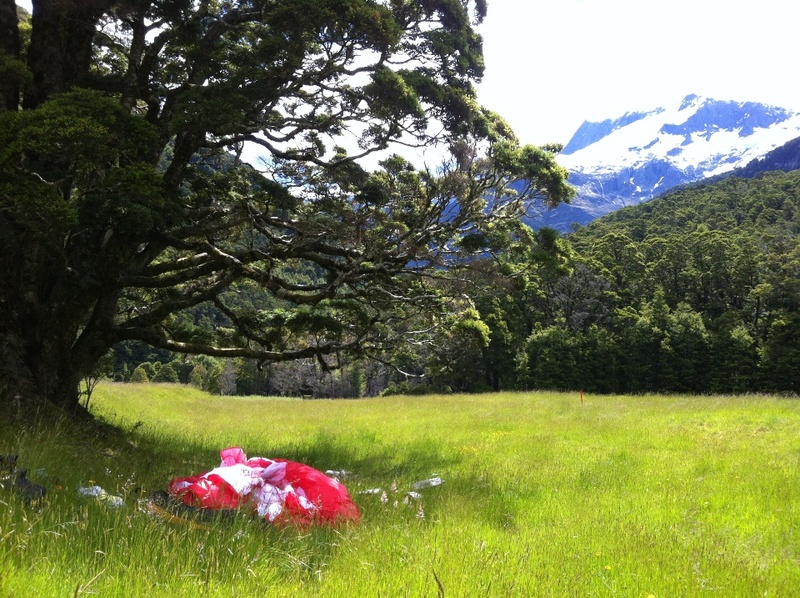 This privilege was awarded to me when I decked it at Junction flat, after trying to soar up beech forest in the valley wind. Soon after it clouded up for the afternoon though so not all was lost. I spent the time climbing up the popular tramping track until it reached the recently burnt hillside where I continued to climb into the evening. At around 6pm the sun came back out and I raced further up the spur to launch. I thought I’d stay high and see how I went, until I launched and that plan went straight out the window. Committing myself to crossing a gully I raced for the west facing cliffs that had recently been obscured by mid-level cloud shadow. It was still working and I gratefully took some great climbs from the cliffs to get back up over 6000′. Back out at the junction of the Matukituki I had the option to glide back towards Treble cone but I flaunted it in favour of gliding behind Fog peak, hoping for a slightly more dramatic leeside climb and high glide. After paying the altitude price with a leeside glide I regained some height but the thermals were too weak to get all the way up. Instead I did a little scenic tour around Raspberry ck (soaring the sharp spur on the Rob Roy side was nice) before landing at the carpark just before sunset. Luckily half an hour later some late returning Texans were waved down to bring me back to my car, but not before the resident possum trapper had driven over and had a chat, offering a well received cold Heineken! 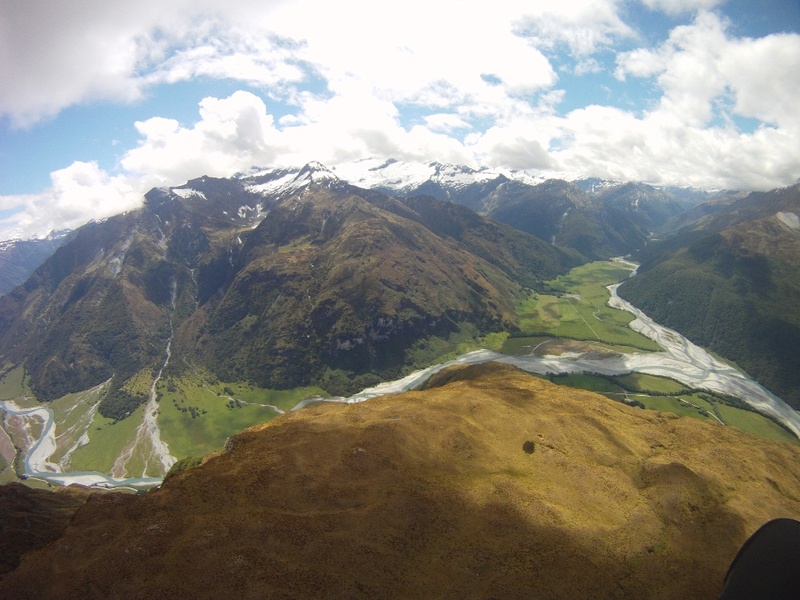 That night I stayed at Joel’s backpackers in Wanaka, meeting Steve, one of the pilots I had been flying with that day. 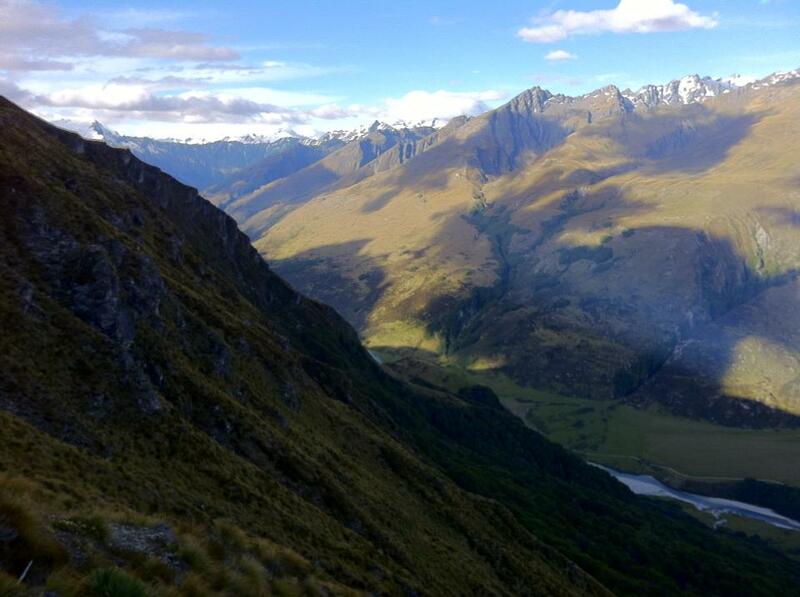 The following day I went back to Treble cone hoping for more of the same. This time I flew with Olivier, the french Swiss I’d flown with the day before. I think he brought his instruments this time, but still after getting high over Treble cone we were unable to get significant climbs and decked it together under Niger peak. We returned for a refly and were brought up the hill by John, Joel, and Steve. 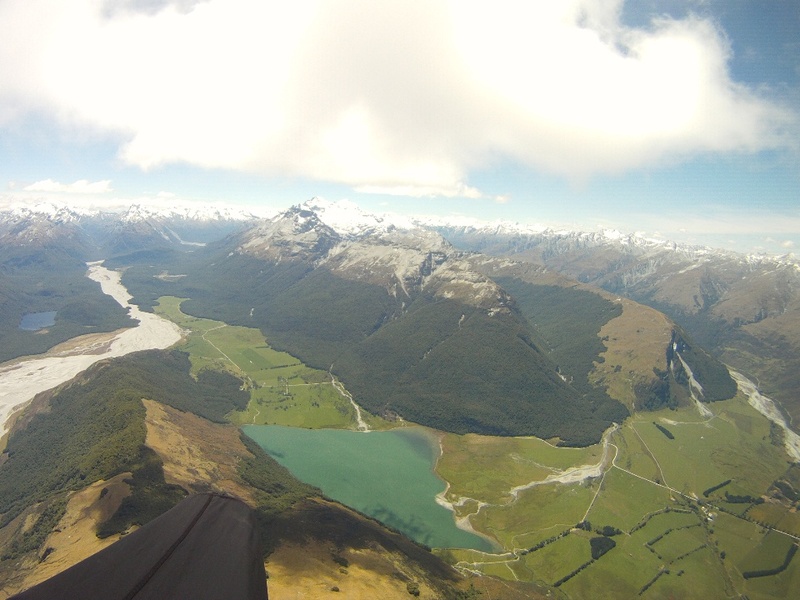 It was on for a flight back to Wanaka – if you had the performance to punch into the NE headwind. It was a good last flight for me, not too committing yet still new territory. 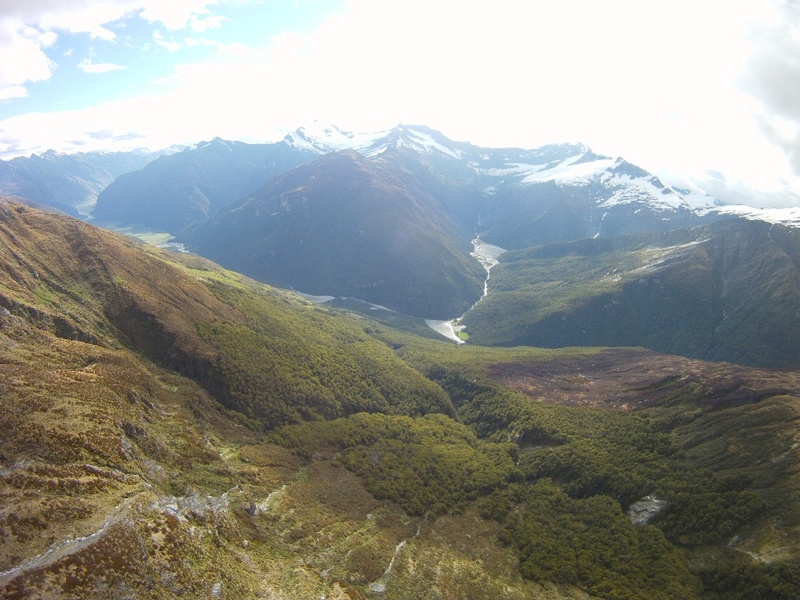 I top landed Roys peak and arranged for my car to be driven back to Wanaka. Then I relaunched, thermalling straight up off the summit and observing a passing sailplane. 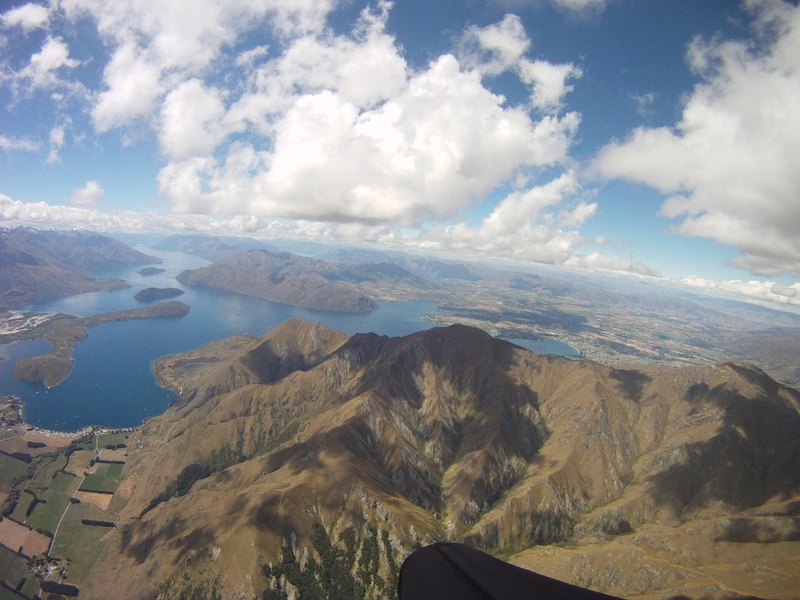 Then over Lake Wanaka above 4000′ I suddenly thought that this was a good scenario in which to try a full stall. Immediately I began shitting myself! In the end the lack of complacency was justified as the wing dived around and I tried to pick a good time to exit. Following this were some well deserved wingovers and a spiral before pushing back to land at the Wanaka skate park. 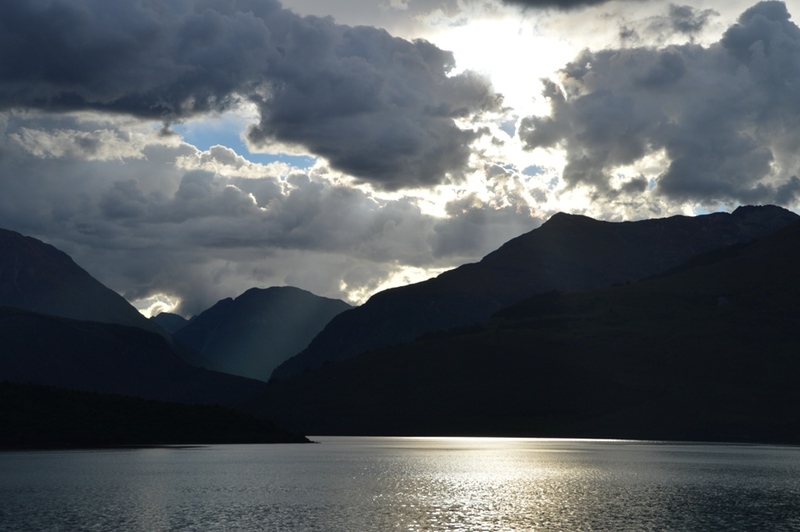 Late that night I returned to Glenorchy and did final packing and cleaning before hitching to Christchurch the following morning. There I caught up with a couple of mates (James, Grey) before an early morning flight to Brisbane. Below are some other photos which didn’t make it onto my previous blog post. 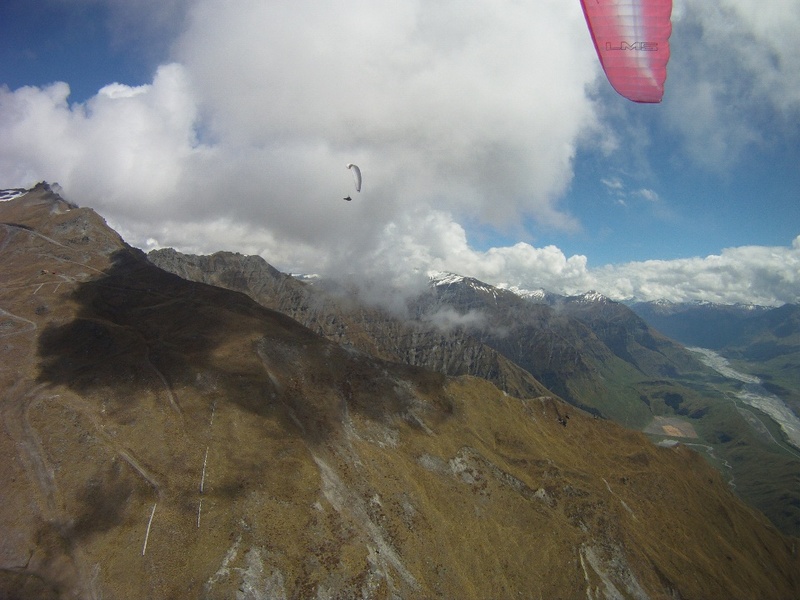 This entry was posted in Uncategorized and tagged adventure, flying, mountains, New Zealand, paragliding, parapente, share my joys, Wanaka. Bookmark the permalink.